Find the right tour for you through Granada. We've got 266 tours going to Granada, starting from just 3 days in length, and the longest tour is 39 days. The most popular month to go is September, which has the most number of tour departures. "Great experienced! The best places were awesome! Hotels were great. Wonderful tour..."
"We loved the tour. We got to see a lot and got to meet a lot of nice people on the..."
"Kassie is the most wonderful guide to be on tour with! Always friendly, cheerful..."
"We had a great overview of Spain and wished it went for longer ! I am not a morning..."
"The Trip Was Very Nice. and Ms Sonia arranged the trip very well and she was very..."
"Like all of the places we went to but would have liked to stay longer at a few places...."
"The trip was beyond my expectations. Our Guide, Lalo was very considerate and very..."
"My Highlights of Spain trip was amazing! I booked, showed up, and everything was..."
"Out tour director (Brek Colling) was amazing, funny, and a master at managing all..."
"Tour guides were excellent. 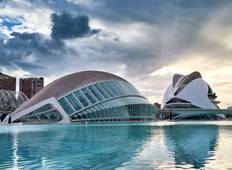 Hotels and meals were average but the coach was comfortable..."
"It was great trip to Spain with Trapsatur as first experience join group tour every..."
"My trip was enjoyable...the hotels were average...great breakfasts. I had three guides,..."
"This cost saver tour isn't cost saving. 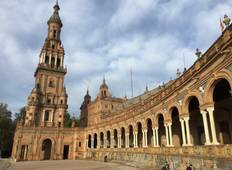 The optional tours add up to a usual tour...."
"The tour was terrific exposing the wonderful aspects of Spain in a short period of..."
"The trip was mostly fine, except that most of the tour members of the tour group..."